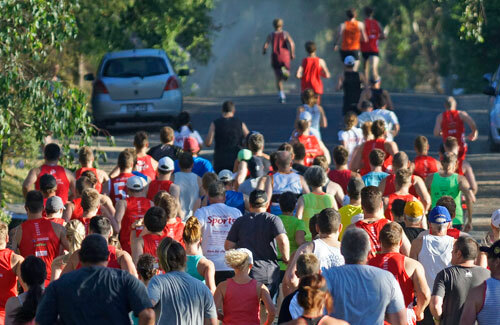 The Run Warrandyte event has been run. Well done to over 350 participants who completed their chosen event well within the allotted time. It was an 8:00am start to miss the heat of the day and to help everyone cool off the South Warrandyte and Warrandyte CFA were on hand to provide water curtains at a number of spots along the course. With staggered starts for each of the distances, and Tomato Timing on hand to provide electronic timing, everyone headed off to tackle the course and the hill on Pound Rd. With up to 3 laps required it was great to see people of all ages out and about supporting a great community event. Everyone was a winner for the under 8’s dash around the oval. After a great warm up by Michael and Marianne the kids took off and blitzed around the oval so fast our volunteers couldn’t keep up. Many volunteers were on hand to provide support and direction. Their assistance is key to the success of any event so from the committee, we thank you all for taking time out of your morning to enable this event to continue each year. We have also received a number of positive comments about the volunteers from participants. We also want to thank our sponsors who are listed on the website, some of whom have been with us since the beginning. Thank you again for your support. We wish everyone a great and healthy year and hope to see you all in 2015.